Update 14/02/2019: The Mahindra XUV300 has been launched at Rs 7.90 lakh, ex-showroom India. Here's why it is priced at a premium as compared to the Brezza, Nexon and EcoSport. Mahindra’s all-new sub-4 metre SUV, the XUV300, has been finally launched. Priced between Rs 7.9 lakh to Rs 12 lakh (ex-showroom India), the XUV300 competes with the best-selling Maruti Suzuki Vitara Brezza, the Tata Nexon, Ford’s Ecosport and the Honda WR-V. With Mahindra offering a host of segment-first features and performance in the baby XUV, let us see if it has what it takes to go head on with its major rivals, on paper. To kick it off, let’s take a look at how these SUVs compare when it comes to pricing. Mahindra has priced the new XUV300 between Rs 7.9 lakh and Rs 12 lakh (ex-showroom). The latest sub-4 metre SUV does not undercut any of its rivals in terms of pricing as Mahindra has pegged it as a premium offering in the segment. Thus, as you can see, the Tata Nexon is the lightest on the pocket among this bunch. But it is worth noting that the Vitara Brezza, which is only offered with a diesel engine, undercuts the petrol variants of most of its rivals. The XUV300, despite not having an automatic variant at launch, overshoots the prices of the automatic variants of the EcoSport and AMTs offered by the Brezza and the Nexon as well. When it comes to sheer size, the XUV300 is right on par with its rivals in terms of length, with all SUVs stopping just short of the four metre mark. However, it edges past its competition with a longer wheelbase. In line with Mahindra’s previous claim, the XUV300 has the longest wheelbase in its segment at 2600mm. Despite being the widest, the XUV300 is only 10mm wider than the Tata Nexon. Sadly though, where it really loses out is boot space. According to our estimates, the boot space of the new XUV300 stands at around 260 litres (Mahindra has not shared the information till now), which is low even by hatchback standards today. Even the recently launched 2019 WagonR packs a bigger 341-litre boot. In terms of competition, the Honda WR-V packs the most space in its trunk with 363 litres. The Ford EcoSport remains the tallest in the segment followed by the Brezza and the XUV300. Apart from the Vitara Brezza, all SUVs in this comparison are available with a petrol variant. The Ford Ecosport, with its 1.0-litre Ecoboost and 1.5-litre petrol motors, is the most powerful SUV here. The XUV300 and the Nexon both churn out the same 110PS of power from their respective 1.2-litre engines, but the former edges past with 200Nm of torque against the Nexon’s 170Nm. The petrol-powered WR-V is the least powerful in this comparison, on paper at least. When it comes to the diesel options, the XUV300 shines with its 1.5-litre engine from the Marazzo churning out 115PS of power. The Vitara Brezza, which packs a Fiat sourced 1.3-litre diesel engine, is the least powerful of the lot. The XUV300 also has the torquiest motor of the bunch at 300Nm. Both the EcoSport and the WR-V make identical power, but the Honda edges past its competition with the highest claimed efficiency at 25.5kmpl. Want to know how the new XUV300 fares against its rivals in terms of real world performance? Read the full first drive review here. All the SUVs here come with a ton of equipment and safety features on board. The XUV300 packs an electric sunroof, dual-zone climate control, keyless entry, push-button start, touchscreen with in-built navigation, and leatherette upholstery. The XUV300 is a better package overall, especially when you take into account the amount of equipment and features it offers. And that, we believe, is the XUV300’s biggest draw. It also gets other segment-first features such as multi-mode steering, heated ORVMs and dual zone auto AC. While all the SUVs get a touchscreen infotainment system, the Nexon packs Harman-tuned speakers for premium audio playback. Android Auto and Apple CarPlay connectivity is also available on all except the WR-V. Except the Brezza and the Nexon, all SUVs get a sunroof as well. The Nexon might be the safest Indian car according to Global NCAP, but the XUV300 aims to to raise the bar with its segment-first seven airbags on offer, which is one more than the Ecosport as well. The Brezza, Nexon and WR-V only get two front airbags which are offered as standard. The Honda misses out on ISOFIX child seat mounts as well. Meanwhile, the XUV300 also gets disc brakes at both front and rear along with parking sensors as well (another segment-first). In comparison, all other SUVs here come with drum-disc setups. They get ABS with EBD as standard whereas top of the line variants get useful features such as hill start assist. Only the XUV300 and the EcoSport get electronic stability control (ESC) and traction control. The EcoSport goes one step further with emergency response system. 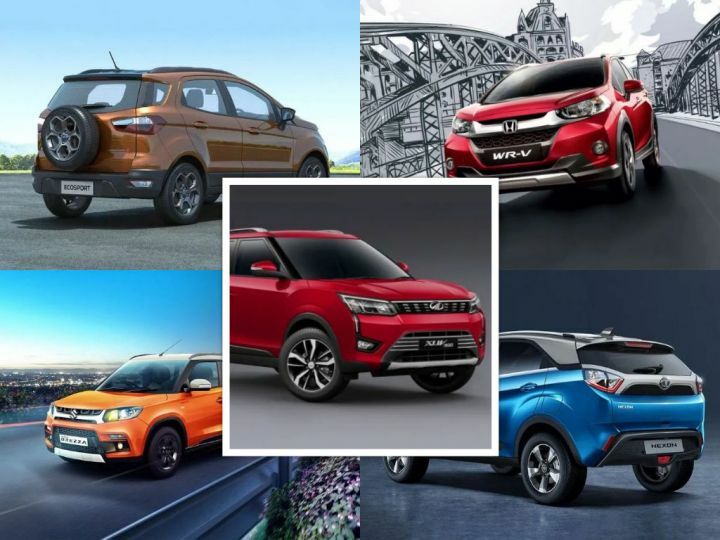 All the SUVs featured here have something going for them - the Vitara Brezza gets a frugal diesel engine and is also the most affordable diesel option in its segment, the Ecosport has robust build and the Ecoboost engine, the WR-V packs crossover styling while the Tata Nexon is the only car here with a 5-star safety rating. The XUV300 edges ahead of its competition, at least on paper, in terms of power, torque and performance figures. It also gets a host of segment-first features which make it stand apart from the competition. However, where it does lack is with the dearth of automatic options and lesser than average boot space. While prices are higher than Maruti Vitara Brezza, Ford EcoSport and Tata Nexon, the XUV300 does come with a lot of kit, right from the base W4 variant to justify the same. Despite the XUV300 being a solid option in the sub four metre segment, it would not really create a serious dent in sales of the segment leader Vitara Brezza. But it definitely has the potential to expand the overall market. While we try to get our hands on all five sub-4 metre SUVs for a thorough comparison, do read our first drive review of Mahindra’s latest offering to see how it fares on the road.